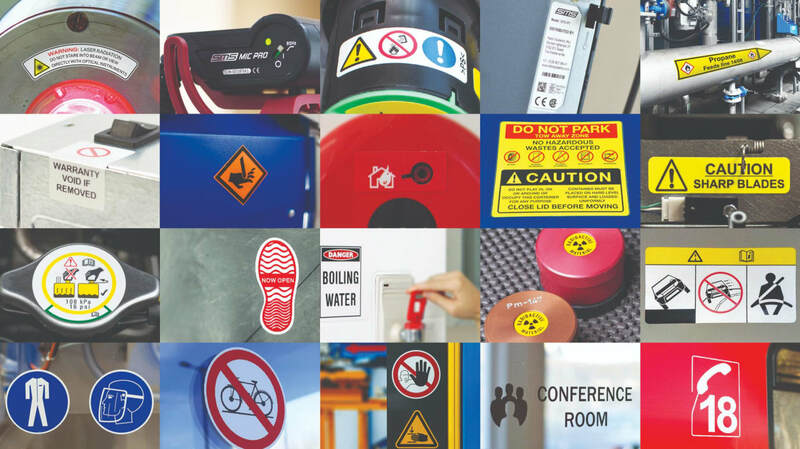 The increasing use of in-house sign and label printers to maximise the speed of sign creation, allowing faster notification of awareness of hazards, has changed the technology now on offer to industry. Flexibility and change are important elements of safety; adapting your safety notices to real time hazards and ensuring a broader audience can understand the warnings is crucial in modern industry. A4 prints, rushed out of a laser printer and stuck up with tape are no longer acceptable, nor is the hand-written notice placed as an afterthought. Durability, especially outdoors, is vital – an important safety message should not fall off or fade due to inclement weather or aggressive environments. The traditional products have been a range of single colour, thermal transfer printers, which use resin ribbons to print onto vinyl and polyesters, coupled with a fit for purpose design software. The single colour ribbons could be changed to give a variety of combinations using different single colour and coloured background combinations, but multiple colours always proved a challenge. Safety signage is a mix of sign and symbols; symbols contain the message in themselves and the sign gives the directive. Multiple languages, the ever increasing numbers of International safety icons and legislations, plus the unpredictability of hazardous environments means keeping any environment effectively ‘signed’ is a challenge. Plant and process safety is more than just safety signage. The labels and notices on machinery and equipment, cables and wires, operating instructions, lock out programmes, warnings and visual prompts all need to be effective and current. They are also uniquely variable in shape, colour and the environment they need to endure and remain legible and in place. The latest developments in in-house systems, where the market demand still stands at a regular 4” or 10cm width – now incorporate both printing in multi-colour and the ability to cut many and varied shapes in one process. Today the need for shapes and multiple colours in in-house sign creation has increased, with the key requirement being ease of use and speed. Keeping sign creation at a level that can comfortably be mastered by all levels of staff requires a carefully tailored package. The new SMS-R1, from Netherlands based Rebo Systems, is a result of this market evolution. It is a quiet, unobtrusive desktop product, coupled with a carefully selected design software and a large range of ribbon colours and sign substrates, that can print in multiple colours and cut out shapes in one process. This combination means the one system can deliver small or large signs, produce mixes of different signs in one process, deliver repeats or one-off messages and produce signage that can withstand all the rigours of a modern industry. The key benefits are easy to measure: speed of production, cost control, flexibility, and durability. Beyond these safety and cost advantages – the ability for none graphically trained operatives to produce highly professional and effective signs and notices is also a major advantage. Unique features of the SMS-R1 have been developed from the ground upwards. Rather than just taking a readily available printing product, Rebo Systems decided to design what they see as the perfect in-house, industrial sign and labelling system available today. Ribbon saving (this alone can save up to 50% wastage) network connection, enhanced speed, (printing at 100mm/sec and cutting at 300mm/sec) and ease of use and keeping the whole production contained within the unit (to stop contamination of the material and the print head – leading to failed print outs and waste) have all been key features on customers’ ‘wish lists’. ‘Ease of use’ inspired creating a unique and independent print driver, meaning customers have the option of using the supplied design software or they can continue to use the software they are already comfortable with to create their safety signs and notices. Another great advantage is the ability to easily update the picture library of the design software with new graphics, new safety icons and diagrams introduced by new legislations and new risks. The current software comes with over 2,000 pre-installed graphical symbols. Rebo Systems also has a library of pre-designed layouts, reflecting common layouts and designs, that can be easily downloaded and edited – making sign creation even easier and more professional.